Former Israeli Prime Minister Ehud Barak, now chairman of the Israeli medical-cannabis company CANNDOC/Intercure, predicted that one out of three people would eventually use some kind of cannabinoid-based product. From left: Rylie Maedler, a 13-year-old from Delaware who has used medical cannabis to successfully treat bone tumors; Saul Kaye, CEO and founder of CannaTech and iCAN: Israel-Cannabis; former Israeli Prime Minister Ehud Barak, now chairman of the Israeli medical-cannabis company CANNDOC/Intercure; and Yona Levy, CEO of Alvit Pharma, one of Israel’s leading cannabis companies. Credit: Israel Kasnett. 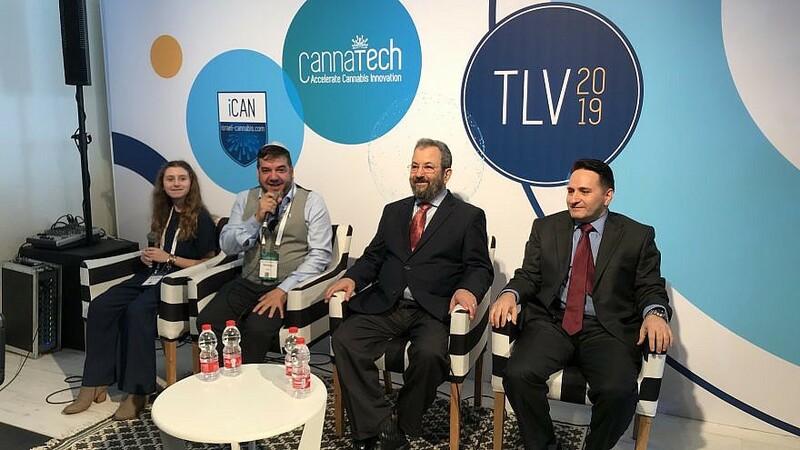 (April 5, 2019 / JNS) Everyone at the CannaTech conference was high—at least, on the idea that greater pharmaceutical and legal recreational usage of cannabis could soon become a reality in Israel. A whopping 1,000 participants from 45 countries gathered in Tel Aviv for the fourth annual CannaTech conference. Fifty Israeli and international companies set up information booths, and nearly 100 corporate sponsors supported the event. Professionals from the fields of pharma, biotechnology, agriculture, medicine and business traveled to CannaTech from Africa, Asia, Europe, North America and South America to learn about the latest developments in the burgeoning cannabis industry, of which Israel plays a major role in every sector. Also speaking was 13-year-old Rylie Maedler. At the age of 7, she was diagnosed with aggressive bone tumors that disfigured her face. Rylie’s mother heard about the efficacy of cannabis oil against cancer and gave it to her secretly, without the hospital knowing. Her tumors shrunk, her bones regenerated, and there has been no reoccurrence since. Thanks to her experience, Rylie helped pass a number of laws in the state of Delaware that benefit children who need cannabis as treatment. Today, Rylie’s focus is to supply quality medical whole-plant botanical oil for holistic relief of debilitating health conditions. Levy was optimistic that the government will eventually push forward legislation to make cannabis use easier.